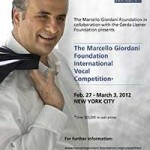 Just as baseball fanatics – especially self-styled scouts — look forward to spring season, opera-lovers savor open contests such as the Marcello Giordani Foundation Vocal Competition, which took place March 3 at the Merkin Concert Hall at the Kaufman Center in New York City. 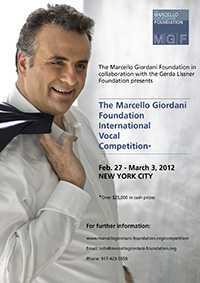 Conceived as a boost for early-career singers, the sing-off could well prove life-changing. As a boon to cash-strapped opera students, www.operagasm.org now posts a nation’s worth of audition opps – categorized by state – every Friday. Struggling aspirants might also appreciate “Some Like It Fach” (www.operapulse.com/refine-your-craft/guide-to-opera-training/some-like-it-fach/), rising soprano Caitlin Vincent ’s fascinating take on the pesky question of vocal typecasting, and her spirited debunking of some age-old taboos in “The ‘Rules’ of Singing” (www.operapulse.com/refine-your-craft/guide-to-opera-training/the-rules-of-singing-mythbusters-edition/). From the spectating perspective, the big news is that the Metropolitan Opera has announced its 2012-13 season, which will feature no fewer than seven new productions and twenty-one revivals. The array kicks off with September 24’s Opening Night Gala, a new production of Donizetti’s L’Elisir d’Amore starring Anna Netrebko, and wraps up with the April 4 debut of Handel’s Giulio Cesare (an ’05 Glyndebourne hit), starring David Daniels as Caesar and Natalie Dessay as Cleopatra. In between are more treats than can be adequately described; for full details, see www.metoperafamily.org/metopera/news/press/detail.aspx?id=21214. Meanwhile, in the short term, we get to delectate the 1991 John Copley version of L’Elisir, with two stellar leads — Diana Damrau and Juan Diego Flórez — making their house role debuts. The March 12, 21, and 21 performances will airing live on Sirius XM Channel 74, and stream live on the Met’s Web site (www.metopera.org) March 21 – the next best thing to being there.